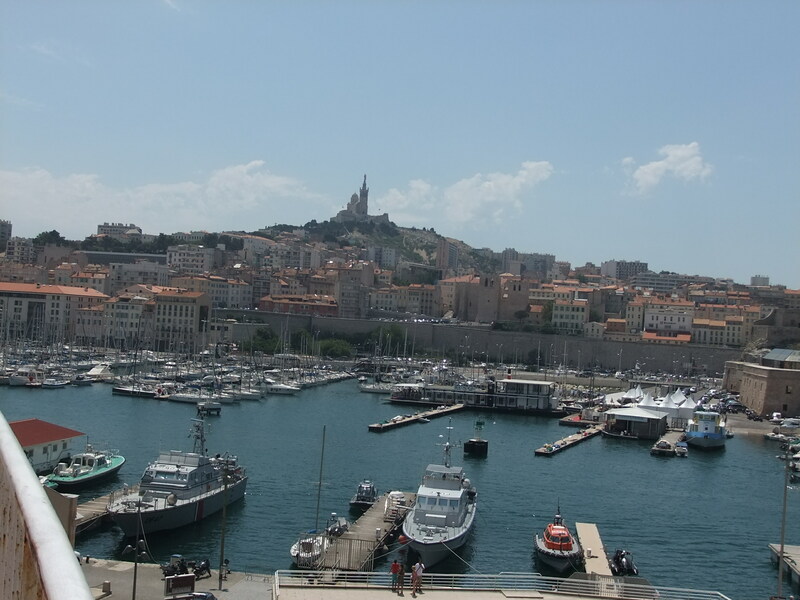 However, after doing some research, we chose another famous city in France to start our journey: Marseille. This port city has been around for thousands of years and has been a place where immigrants from all over the world have come to settle. With so many people and such a long history, Marseille has been known to have crime, dirty streets and a different attitude than some of the more touristy places in France. Not many tourists consider Marseille because of its reputation. Famous travel guide author Rick Steves even says that the city challenges you to “find its charm” because it doesn’t fit the idea of the Provence region and that it only has one essential sight to see. To change that mindset, Marseille underwent a complete transformation in order to ready itself as the 2013 European Capital of Culture. Marseille seemed like the perfect place to experience another side of France. Upon arrival, we were pleasantly surprised by the people’s friendliness, their pride in the city, the variety of food and the culture. The locals were happy to tell us stories about the changes in Marseille and show us where to find the best, local food. The sellers in the market were excited to show off their wares and tried to throw in a little political talk about America. One even told me that he preferred Pres. Bush over Pres. Obama. We just smiled, said “merci” and walked away. Since Marseille isn’t a top tourist destination, there aren’t many guides out there on what to see and do in the city. 1. The produce market off La Canebiere near Cours Belsunce – The market is so full of life and everything is fresh and beautiful. Behind the produce stands are brick and mortar shops with spices, meats, knick knacks and a ton of other goodies to check out. 2. Have dinner in Le Panier district – This district with its narrow streets, old steps and historic buildings is where the locals go to enjoy a dinner out. We found a perfect little restaurant called Au Vieux Clocher off a side street that has a beautiful area outside to sit for dinner. The menu was written on a chalk board and the server only spoke French. 3. Take Le Petit Train to the Notre-Dame de la Garde – the church is located on top of quite a large hill and would take quite a bit of your day’s energy to get there. So, why not take “the little train” up while enjoying a scenic view along the way? The train is only 7 Euros per person and is definitely worth it. It drops you off and picks you up right in front of the church. 4. Check out La Vieux Port and the two forts – The recently renovated and cleaned up port is the perfect place to enjoy a cup of coffee and the views. There are a ton of restaurants on the port, but many of them cater to tourists and are overpriced. 5. Take a day trip to Aix en Provence – The train station is easily accessible in Marseille, and if you have the time, a day trip to Aix is highly recommended. The train takes about 30 minutes and drops you off in the center of town. Aix is a quaint, picturesque French town that shows a different side of France than Marseille and has tons of restaurants and shops to enjoy. 6. Shop at the Monoprix – This grocery story/department store has everything a local needs including some great rose wines for about 3 euros a bottle. 7. Have a doner kebab sandwich – Marseille has a lot of Middle Eastern roots and that means some great food. We thoroughly enjoyed the doner kebab (meat roasted on a turning spit by a fire) sandwiches with crispy french fries for lunch one day. Cheap and delicious. 8. Eat a nutella crepe – This is a must do in any city in France, of course, and Marseille is no different. 9. Drink the local wine – While Marseille itself isn’t known for its wine, the vineyards of Provence aren’t far away. The wine from this region is some of my favorite. If you are interested in a wine tour, I suggest Provence Wine Tours. The tour guide is spectacular and the vineyards are amazing. 10. Don’t stress about trying bouillabaisse – This “must-eat” fish soup of Marseille isn’t a must-do in my book. Unless someone invites you to their home and has a pot simmering on the stove, you will likely be overcharged for this dish at most places in the city. Overall, Marseille has plenty to offer the tourists wanting to explore another side of France. We stayed there for a week and could have stayed longer because there were parts of the city we didn’t even get a chance to explore.